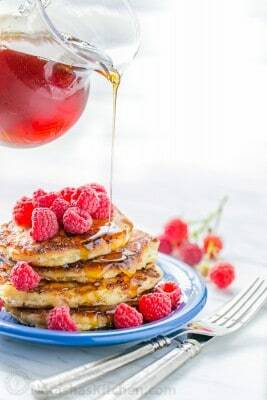 These cottage cheese pancakes are fluffy, delicious, easy to make and have really simple ingredients. They also reheat really well in the toaster if you have leftovers. In a medium bowl, whisk together 4 large eggs until well beaten. Add 16 oz cottage cheese, 1 tsp vanilla, 3 Tbsp honey and whisk until combined. Stir in 1/3 cup raisins. In a separate small bowl, whisk together 1 cup + 2 Tbsp flour and 1 tsp baking soda (if your baking soda has any lumps at all, sift it into the flour). Whisk the flour mixture into your wet ingredients. Heat a large non-stick skillet over medium/low heat and add 2 Tbsp oil. Once the oil is hot, place a heaping tablespoon of pancake batter into the hot oil and sauté until golden and puffed up (about 2 min per side). I recommend a splatter guard since these do create a little bit of a splatter. If it's splattering alot, turning the heat down will help. Serve warm with sour cream, maple syrup, fruit or jam, or all of the above!